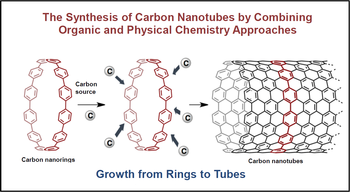 Professor Kenichiro Itami at the Institute of Transformative Bio-molecules, Nagoya University, and his co-workers1 successfully developed the world's first method for synthesizing structurally uniform carbon nanotubes (CNTs) by combining organic and physical chemistry approaches. Their paper was published online in Nature Chemistryon May 26, 2013. CNTs are tubal materials that consist only of carbon atoms and are several nanometers in diameter and several micrometers in length. They are 20 times stronger than steel and have very good heat and electric conduction. Furthermore, they are very light and have received a tremendous amount of interest from all areas of science and technology. Currently, CNTs are produced using a physical chemistry approach, with which they cannot be synthesized exactly as desired. 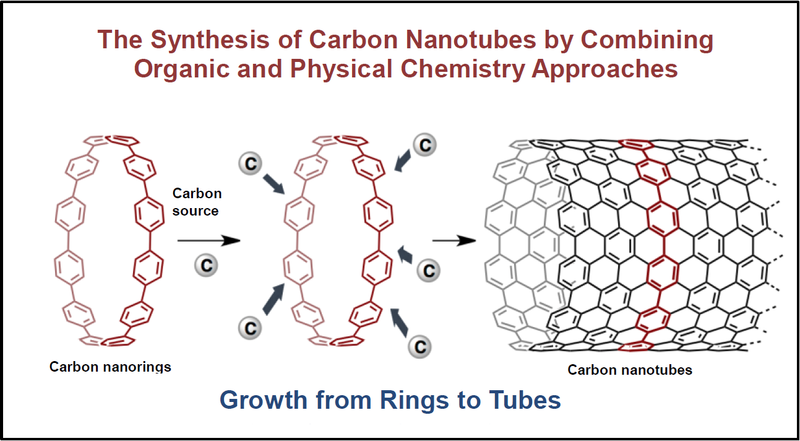 Professor Itami previously developed a method for the specific production of carbon nanorings, the smallest unit of the CNT structure. This time, his group succeeded in producing CNTs as predicted by simply heating differently sized carbon nanorings at 500 oC with ethanol on a substrate coated on a sapphire substance. This technique is a breakthrough method that will lead to the programmable synthesis of uniform CNTs on the basis of the size of the carbon nanorings used as the templates. 1. Haruka Omachi, Takuya Nakayama, Yasutomo Segawa (Department of Chemistry, Graduate School of Science, Nagoya University) and Eri Takahashi (Synthetic Organic Chemistry Laboratories, Research and Development Management Headquarters, FUJIFILM Corporation). Professor Kenichiro Itami entered academia in order to create new materials with revolutionary functionality. He aims to produce a new substance someday in the future that he will call 'Itamin' and that will help improve people's lives. Currently, he serves as the director of the Institute of Transformative Bio-Molecules, which is one of the six institutes selected by The World Premier International Research Center Initiative (WPI Program).2 He will change the world with molecules by melding synthetic chemistry with biological science. 2. The World Premier International Research Center Initiative (WPI Program) is launched by the Ministry of Education, Culture, Sports, Science and Technology (MEXT), andaims to build research centers with world-leading researchers. "Hereafter I will advance this research and elaborate completely homogeneous carbon nanotubes." "To research is to blaze a new trail that no one has ever stepped in. You learn out of textbooks in high school and in undergraduate school. You make textbooks in research. You can enjoy excitement plenty of times, of being the world-first detector of something, and playing irreplaceable role in the world. Why don't you join us and make a change in scientific research?"